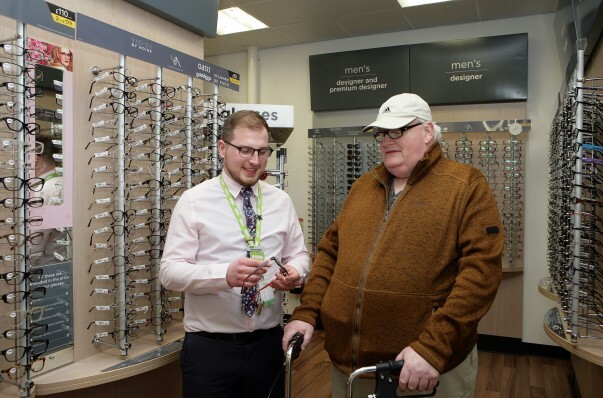 Asda customer Billy Irwin paid a special visit to our Enniskillen store to say thank you to our optician Ross Hennessey who spotted signs of a stroke during a routine appointment. Billy, who's now made a good recovery, was in the store to collect a new pair of glasses when he started to feel pain in his eyes. Ross recognised the symptoms during a quick examination, and advised Billy to go to hospital straight away. Billy's wife and son were with him and drove him to hospital, where it was confirmed he'd had a stroke. Medical staff praised Ross's quick-thinking actions and said things could have been much worse without his help. Billy said: “I cannot thank Ross, and Asda Enniskillen colleague Darren Burns, enough for everything they did for me on the day I suffered a stroke. "If it hadn’t been for Ross spotting the signs so quickly, the outcome could have been very different. The doctors who treated me said it could have resulted in paralysis if there had been a longer delay in my treatment. “My son Patrick was in contact with Ross and Darren in the weeks of recovery that followed – and it really meant a lot to me that they were so concerned to hear how I was getting on. Ross said: “It was great to be reunited with Billy instore – and to see how well he has recovered after his stroke. All of the colleagues at Asda Enniskillen were so pleased to be able to welcome him back and see how well he is doing. “Billy’s experience reinforces the importance of regular eye-checks, and to get in contact with your optician if you are experiencing any unusual symptoms. We're specially trained to spot the symptoms of a number of serious medical conditions, including a stroke."